All of Peter and Nancy’s children are buried in Elderton Cemetery. 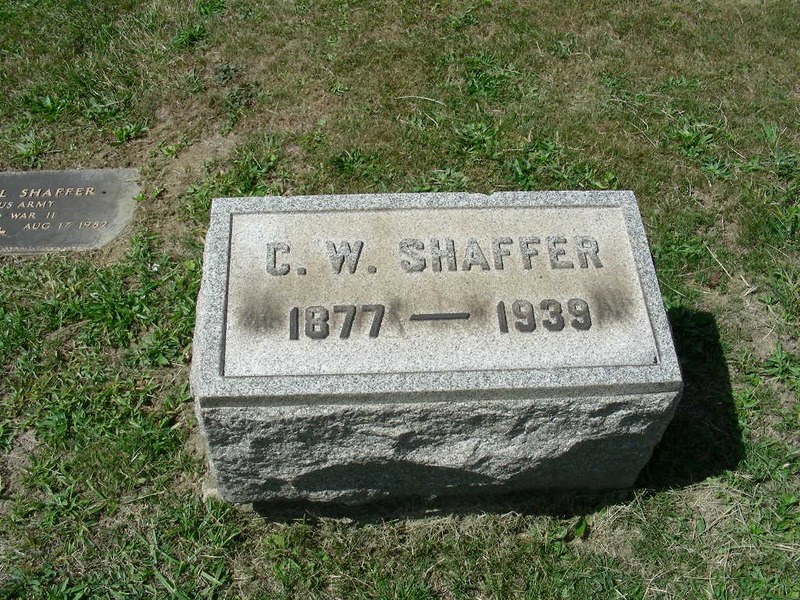 Peter and Nancy Shaffer’s tombstone. Oldest daughter Minnie Elizabeth Beatty was married to John Frailey in about 1894. 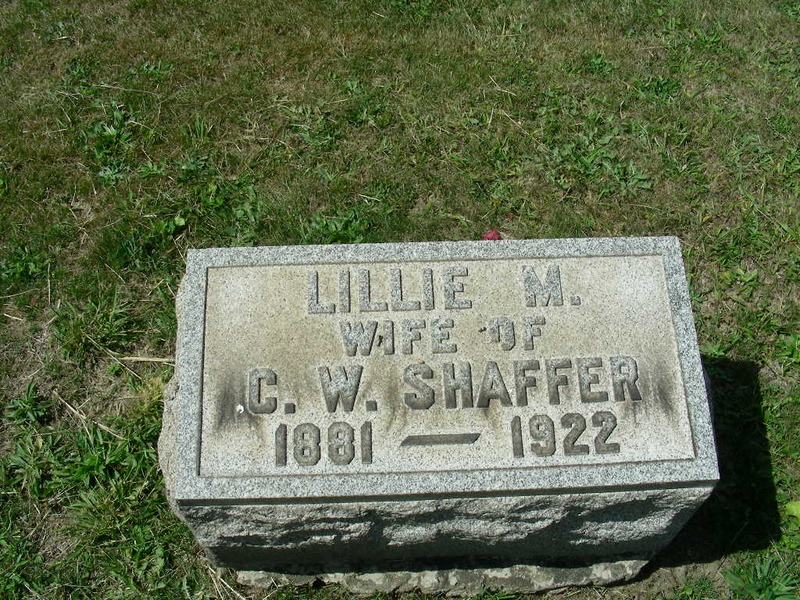 Oldest son Charles Wilmer was married to Lillian May Kelley. Son Leason J was married to Mary A. Hilliard. Son Harry Oliver was married to Martha Pearl Williams. Son George Addison was married to Zelma Smith. Youngest son, Christopher Nesbitt was married to Zula Agnes Smeltzer. Photos not taken by me courtesy of Ralph Satterfield and other contributors. I think we need a little recap of where we are in the tree, it’s easy to get lost in the jumble of names. We are going to go up the Shaffer line next. 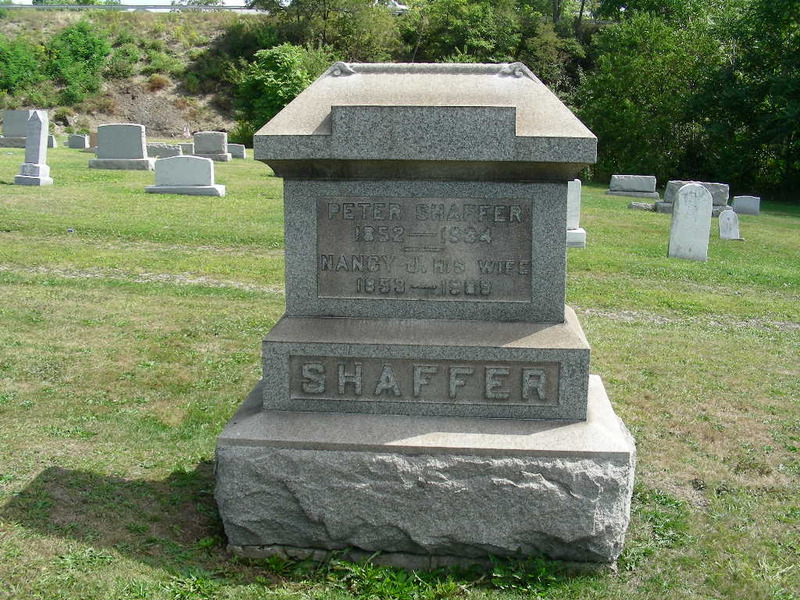 While Peter Shaffer is not the biological father of Anna Mary Beatty, he was the husband of Nancy M.J. Beatty and Anna’s children considered him to be their grandfather. I have noted that he is her stepfather, but he appears on our family tree in the paternal slot. So here once again is the tree of Robert Clare Scott and we are looking at his mother’s paternal line. Peter was born 12 Jan 1852, in Plumcreek Township, Armstrong, Pennsylvania, the son of John and Harriet (Craig) Shaffer. Right off the bat, we have the first “diffugilty.” His Pennsylvania death certificate and his obituary both state he was born in 1849.1,2 His tombstone actually has the correct date of 1852. Why do we know the stone is right and the documents are wrong? He does not appear on the 1850 census with his parents, but he does appear on the 1860 census at the age of seven.3,4 He remains consistent in his age on the census records from 1870 – 1920, usually declaring himself to be born in 1852 (ages: 19, 28, 48, 58, 69).5,6,7,8,9 The only time this varies is on the 1930 census when his age is listed as 81.10 He is living with his son and his family so it is possible that Peter was not the informant. 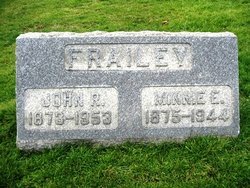 The informant on his death certificate was Mrs. John Frailey. That’s right, Peter and Nancy M.J.’s daughter Minnie. The same one who was living with her grandmother Rebecca Beatty on the 1900 census when all of Rebecca’s information changed. I have gone with the 1852 date that is consistent with the records that either he or his parents would have provided. The second “diffugilty” comes with the middle name. As I mentioned in my post about Nancy, the middle names are an issue. Peter never appears on any documents (created while he is alive) with a middle initial or name. The only times the initial K appears is on his death certificate and then again in his obituary. That information was provided by daughter Minnie. The next odd middle name, Levi, appears in the obituary of his son Christopher and is probably provided by his daughter-in-law Zula.11 At the time Christopher died, Zula would have been well up in her 70s and Peter had been dead over forty years. I have not yet found the name of Levi used by any other Shaffer or Craig family members of Peter’s generation or previous. 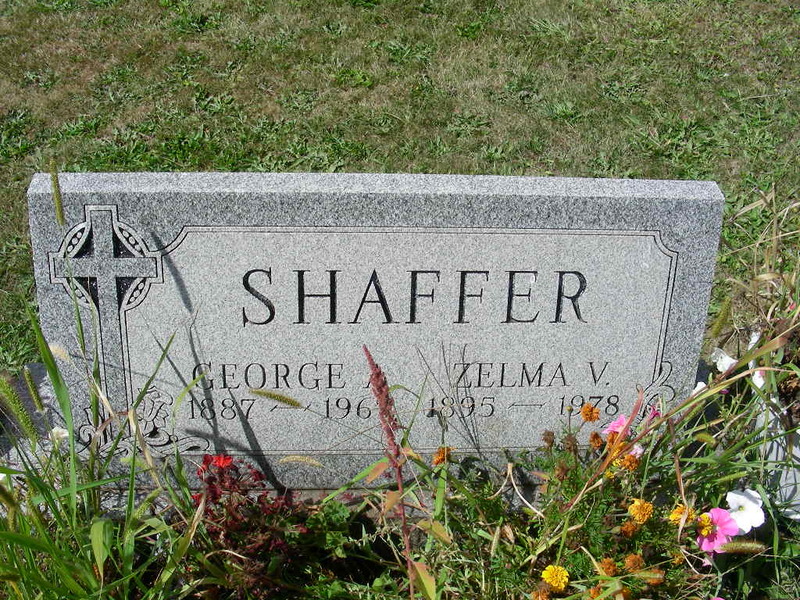 His tombstone reads simply Peter Shaffer, which I believe to be the most correct. Based on the records created while he was alive, I have chosen not to use the middle initial or middle name. I will continue to explore records to see if he ever uses an initial on either tax, land, or voting records. He married Nancy M.J. Beatty in about 1874. I have not yet found a marriage record for the couple. This date is based on the 1900 census and the birth of their first child together. Peter remained in Plumcreek Township his entire life and did not remarry after Nancy died in 1909. An 80 year old Elderton farmer lay in his home today with a serious head injury, suffered when the wagon on which he and a 30 year old son were riding, was wrecked in a heavy fog Thursday morning. The farmer, Peter Shaffer, living about a mile from Elderton, was unable to recognize members of his family late yesterday. He is in a semi-conscious condition. The son, Christopher Shaffer, was less seriously injured. The two were enroute to another farm when a car driven by Joseph Coulter, of Girty, enroute to Kittanning, collided with the wagon in the heavy fog. The force of the collision hurled the two men on the wagon onto the concrete. They were taken to their homes and Dr. E. E. Keeler of Elderton was summoned. He has been administering treatment since. Peter died 4 January 1934 in Plumcreek Township of apoplexy. His death certificate lists the secondary cause as epilepsy, listing the duration of that condition as three years, possibly linking it to the accident above. He is buried with his wife Nancy in the Elderton Cemetery. Minnie Elizabeth (28 Jun 1875 – 26 Jun 1944) m. John R. Frailey (abt. 1873 – 1953). Remained in the Elderton area all their lives, buried in Elderton Cemetery. Charles Wilmer (18 Jun 1877 – 26 Aug 1939) m. Lillian May Kelley (1881 – 1922). Remained in the Elderton area all their lives, buried in Elderton Cemetery. 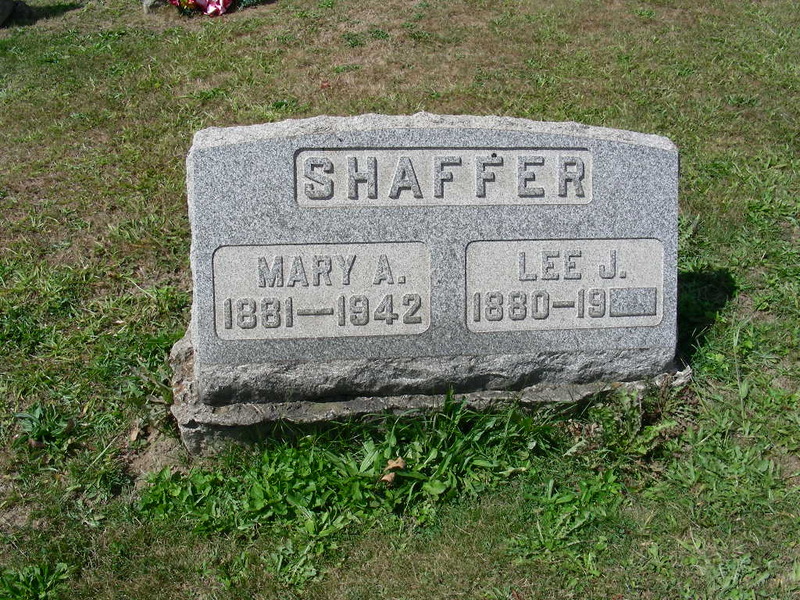 Leason J. Shaffer (Jan 1880 – 19XX) m. Mary A. Hilliard (15 Oct 1882 – 18 Jul 1942). Removed to Niles, Trumbull, Ohio, buried in Elderton Cemetery. His tombstone does not have the last two digits engraved. Harry Oliver (11 Jun 1882 – 17 Mar 1960) m. Martha Pearl Williams (30 Mar 1886 – 17 May 1968). Remained in the Elderton area all their lives, buried in Elderton Cemetery. 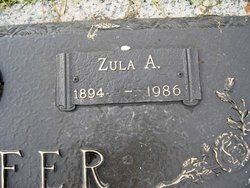 George Addison (30 Sep 1887 – 26 Jan 1967) m. Zelma Smith (25 Sep 1895 – 26 Jan 1978) Remained in Elderton most of their lives, removed to Corning, Stueben, New York much later. Buried in Elderton Cemetery. Christopher Nesbitt (1 Nov 1889 – 10 Jul 1976) m. Zula Agnes Smeltzer (15 Aug 1894 – 21 Nov 1986). Remained in the Elderton area all their lives, buried in Elderton Cemetery. I have not included family group sheets for these people because many of their children are still living. Does anyone have a picture of Peter Shaffer? If so I would very much like a scan of the image for Peter or his wife Nancy. 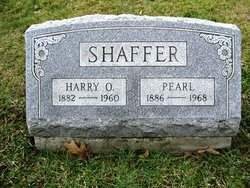 My next post will be the tombstones of these family members and then we will move back a generation and attempt to deal with Peter’s parents, John and Harriet (Craig) Shaffer. 1. 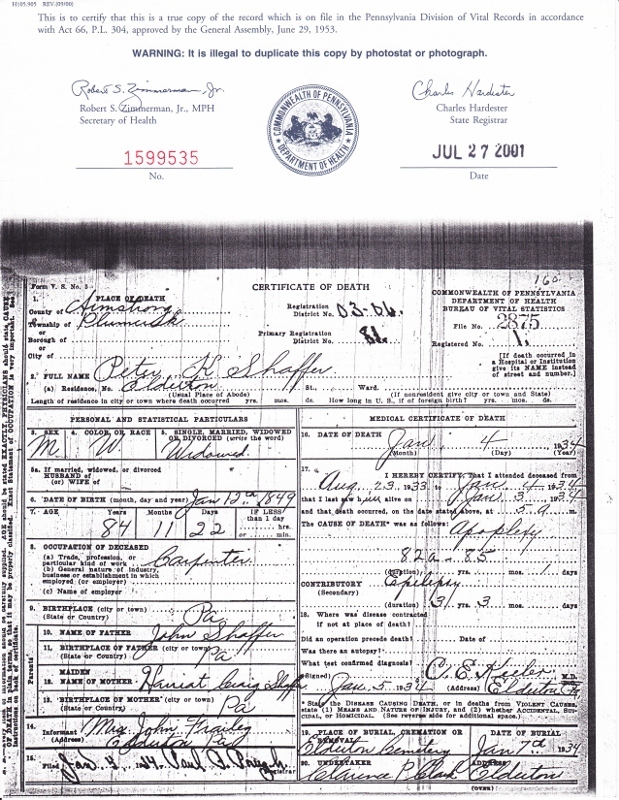 Pennsylvania Department of Health, death certificate 2875 (1934), Peter K. Shaffer; Division of Vital Records, New Castle. 2. Obituary, “Peter K. Shaffer,” The Indiana Evening Gazette, 5 Jan 1934; digital images. 3. 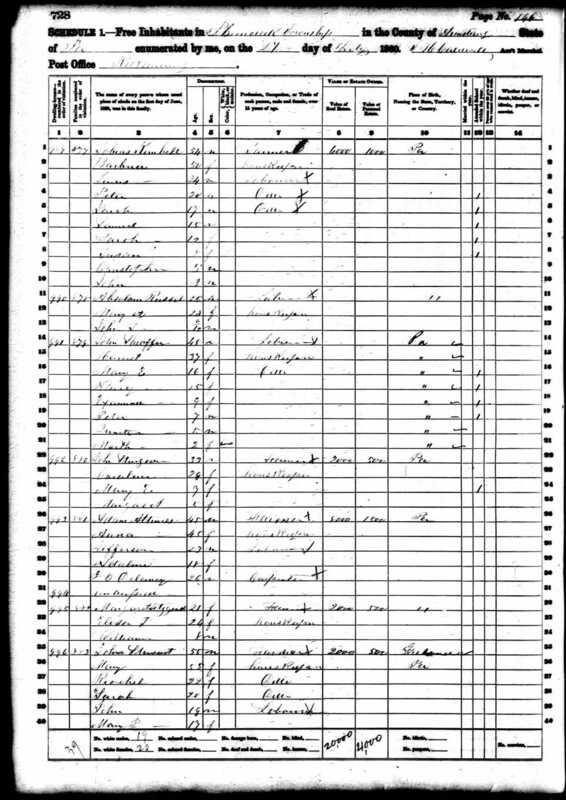 1850 U.S. census, Armstrong County, Pennsylvania, population schedule, Plumcreek Twp., p. 342A, dwelling 120, family 120, John Sheaffer; digital images, Ancestry (http://www.Ancestry.com : accessed 20 Dec 2011); citing National Archives and Records Administration microfilm M432, roll M432 749. 4. 1860 U.S. census, Armstrong County, Pennsylvania, population schedule, Plumcreek Twp., p. 728, dwelling 991, family 879, John Sheaffer; digital images, Ancestry (http://www.Ancestry.com : accessed 20 Dec 2011); citing National Archives and Records Administration microfilm M653, roll M653 1069. 5. 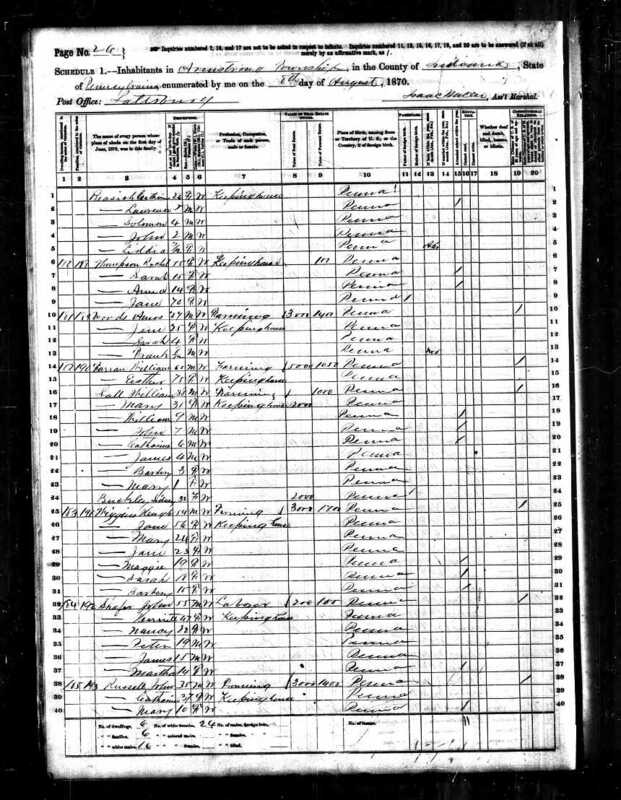 1870 U.S. census, Indiana County, Pennsylvania, population schedule, Armstrong Twp., p. 13, dwelling 184, family 192, John Shaffer; digital images, Ancestry (http://www.Ancestry.com); citing National Archives and Records Administration microfilm M593, roll 1350. 6. 1880 U.S. census, Armstrong County, Pennsylvania, population schedule, Plumcreek Twp., enumeration district (ED) 5, p. 124, dwelling 283, family 301, Peter Shaeffer; digital images, Ancestry (http://www.Ancestry.com : accessed 6 Mar 2010); citing National Archives and Records Administration microfilm T9, roll 1096. 7. 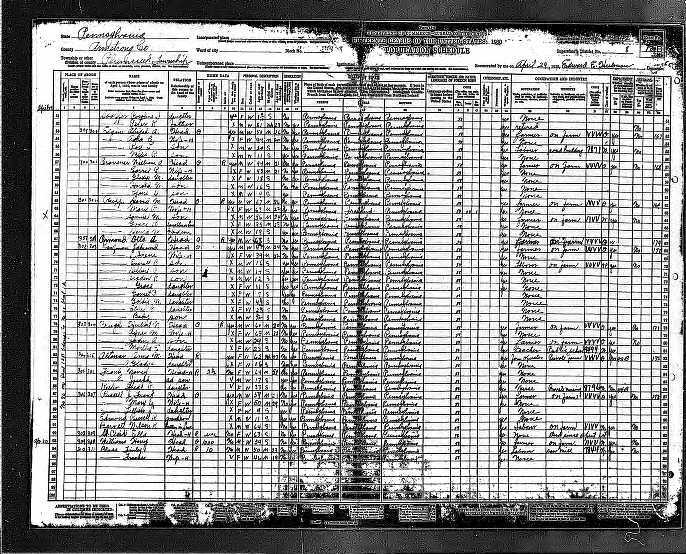 1900 U.S. census, Armstrong County, Pennsylvania, population schedule, Plumcreek Twp., enumeration district (ED) 11, p. 6B, dwelling 137; digital images, Ancestry.com (http://www.Ancestry.com); citing National Archives and Records Administration microfilm T623, roll 1373. 8. 1910 U.S. census, Armstrong County, Pennsylvania, population schedule, Plumcreek Twp., enumeration district (ED) 37, p. 5, dwelling 79; digital images, Ancestry (http://www.Ancestry.com); citing National Archives and Records Administration microfilm T624, roll 1310. 9. 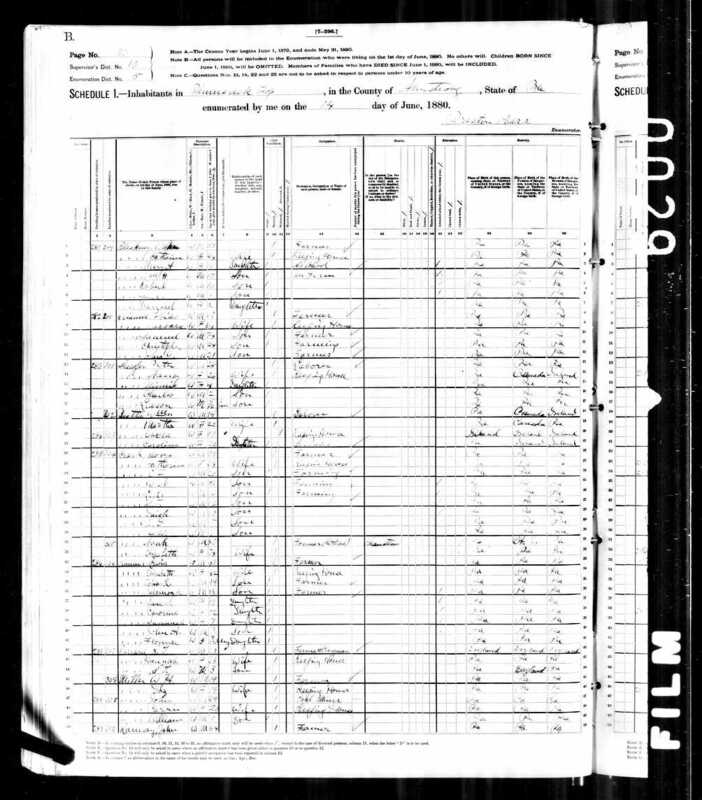 1920 U.S. census, Armstrong County, Pennsylvania, population schedule, Plumcreek Twp., enumeration district (ED) 15, p. 4A, dwelling 68; digital images, Ancestry (http://www.Ancestry.com); citing National Archives and Records Administration microfilm T625, roll 1508. 10. 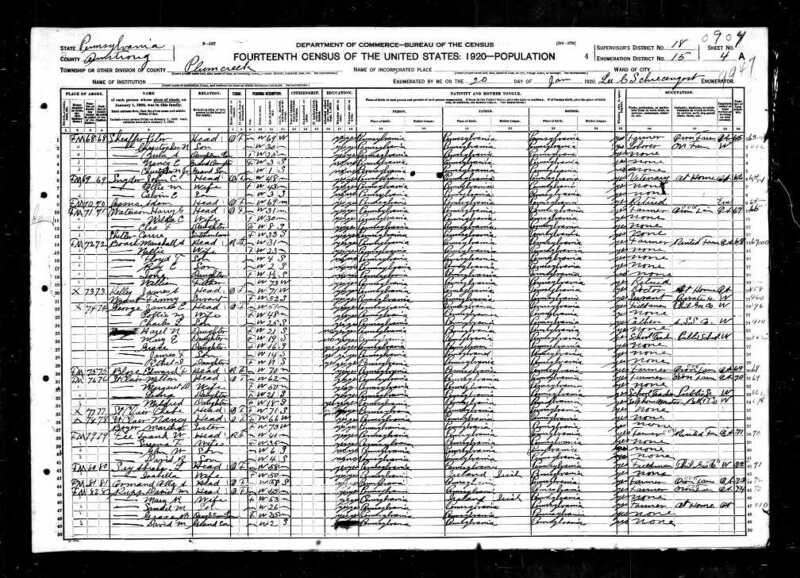 1930 U.S. census, Armstrong County, Pennsylvania, population schedule, Plumcreek Twp., enumeration district (ED) 42, p. 13A, dwelling 298; digital images, Ancestry (http://www.Ancestry.com); citing National Archives and Records Administration microfilm T626, roll 1994. 11. 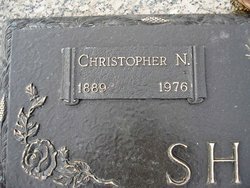 Death Record, “Christopher N. Shaffer,” The Simpson Leader Times, 10 Jul 1976, p. 7, col. 8; digital images, NewspaperArchive (http://www.newspaperarchive.com : accessed 19 Dec 2011), Historic Newspapers. 12. News Article, “Elderton Farmer Injured,” The Simpson Leader Times, 30 Oct 1931, p. 1; digital images. This is what little I know about the four older children of Willem Burggraaf and Sygje Stek. Youngest son Jan will be addressed in his own series of posts. Sygje Van Ginkel m. John Revisor Cross Jr.
Based on the 1900 census3 on which Jan lists himself as a widower, Jantje died between 4 January 1891 and 1896. The 4 January date is based on the baptism record of daughter Sygje.4 If she was not alive at the baptism it would have been noted at that time. I believe that she was probably deceased prior to 1896 because I have not found her on the 1895 Iowa State Census, but the rest of Van Ginkel family is in Mahaska County on that census.5 I have found no death or cemetery record for Jantje. Albert died 14 May 1928 in Mahaska County and is buried in Union Mills Cemetery. According to Sygje’s 1900 census records Goverdina is deceased prior to 1900. She and her husband Arie died in Sioux County, Iowa. 2. “Iowa Marriages, 1851-1900,” database, Ancestry (http://www.ancestry.com: accessed 10 Jan 2010), Jantje Burggraaf to Jan Van Ginkel, 5 Apr 1872. 4. First Reformed Church (Pella, Iowa, USA), “Communicants and Baptisms 1857-1975,” Baptism Sygje Burggraaf 4Jan 1891; FHL microfilm 0,985,401. 5. State Historical Society of Iowa, “Iowa State Census, 1895,” database, Ancestry (http://www.ancestry.com: accessed 10 Feb 2010), John Vanginkle. 6. First Reformed Church (Pella, Iowa, USA), “Communicants and Baptisms 1857-1975,” Baptism Albert Burggraaf 26 Mar 1859; FHL microfilm 0,985,401. 7. “Iowa Marriages, 1851-1900,” database, Ancestry (http://www.ancestry.com: accessed 10 Feb 2010), Albert Burggraaf to Gertie De Penning, 3 Aug 1871. 8. First Reformed Church (Pella, Iowa, USA), “Communicants and Baptisms 1857-1975,” Baptism Goverdina Burggraaf 26 Mar 1859; FHL microfilm 0,985,401. 9. “Iowa Marriages, 1851-1900,” database, Ancestry (http://www.ancestry.com: accessed 10 Feb 2010), Goverdina Burggraaf to Dries Van Hulzen, 15 Jan 1872. 10. 1880 U.S. census, Marion County, Iowa population schedule, Lake Prairie Twp., enumeration district (ED) 120, p. 524, dwelling 72, family 72, Deena Van Houlzen; digital images, Ancestry (http://www.ancestry.com: accessed 17 Feb 2010); citing National Archives and Records Administration microfilm T9, roll 354. 11. First Reformed Church (Pella, Iowa, USA), “Communicants and Baptisms 1857-1975,” Baptism Annetye Burggraaf; FHL microfilm 0,985,401.